Situated on the southern tip of Manhattan, Battery Park has become a paradigm for mixed-use urban renewal developments. Constructed on a 92-acre landfill site, the development consists of over 14,000 housing units and six million square feet of office and commercial space. Programming spaces include a new 50,000 sq. ft. LEED Platinum certified community center adjacent to Ground Zero. Diverse amenities of the facility include two swimming pools, a gymnasium, theater, classrooms, and recreation and dance spaces, all with natural lighting in the primary spaces. 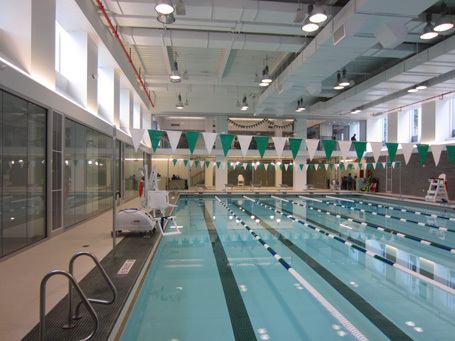 Working with Hanrahan Meyers Architects, Counsilman-Hunsaker was chosen for their aquatics expertise to design the aquatic components including a six lane 25-yard training/teaching pool and a 450 sq. ft. children’s pool complete with a moveable floor system. Both pools include an ultraviolet light water treatment system for dramatically improved air quality and superior sanitizing of the pool water. The primary architectural feature of the new Battery Park City Community Center is the 500 ft. long glass ‘Wall of Light’ situated at the base of two new residential towers in Battery Park City’s North Neighborhood immediately north of Ground Zero. The wall is a public promenade and demonstrates the passive energy systems fueling the new Community Center.